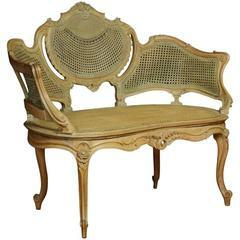 Distinctive vintage Louis XV style hand carved armchair having open and down swept arms and elegant cabriole legs. Upholstery shows wear and some staining. Measures: Seat height 27" Arm height 19.50". 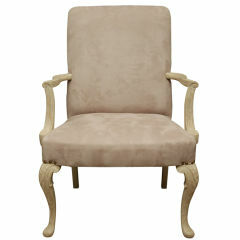 Painted, newly upholstered Louis XV provincial style painted arm chair. 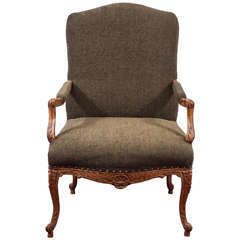 Painted, newly upholstered Louis XV provincial style painted armchair. 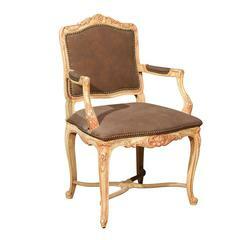 Louis XV style fauteuil by Oscar Shadell, Inc with a carved, distressed paint decorated frame. 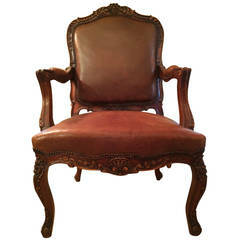 Louis XV style walnut fauteuil with brown leather, intricate carved floral designs. 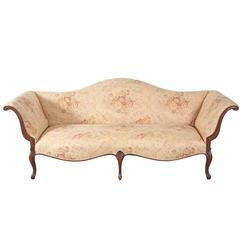 Beautiful sofa in Louis Quinze style. Solid wood carved with poliment gilding. High quality fabric with embroidered Baroque pattern. 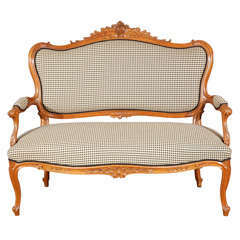 Pair of Louis XV style distressed painted fauteuils.